Last week, I had phone meetings, deadlines and trying to find time for breakfast was a bit much. Now, normally, I’m totally a breakfast kind of girl so skipping it is a bit usual. But when 12 noon arrived, and I had a break in my schedule, I was more than ready for some food. So I whipped up this pie/quiche kind of thing using leftover brown rice and the remaining broccoli from the previous night’s meal. The resulting meal was quick and tasty. 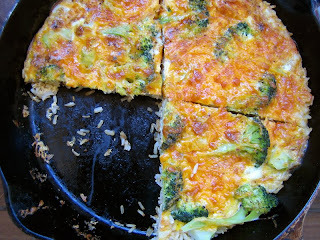 I wasn’t sure if the brown rice crust would actually hold up as crust, but it worked surprisingly well! 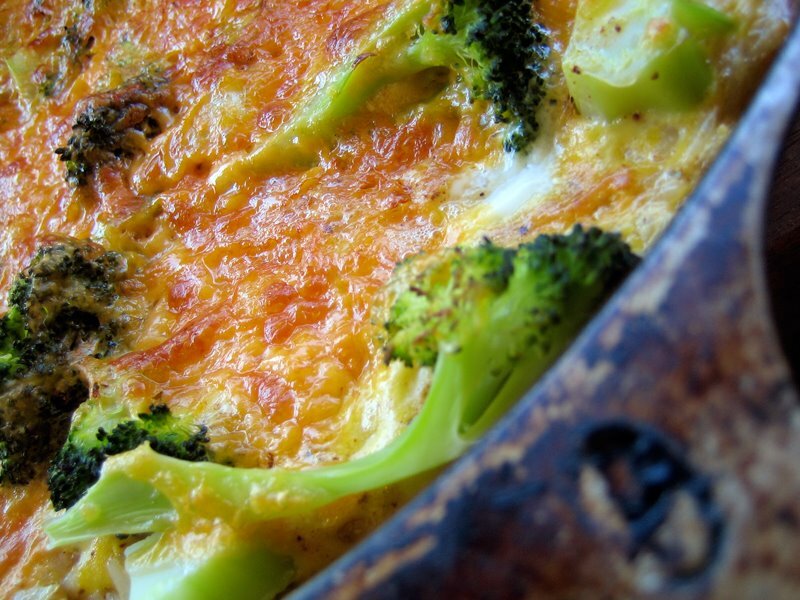 The cheesy-eggy topping studded with broccoli made for a pretty comforting spread…just the thing for someone who hadn’t had anything (but coffee) all morning! Served with a green salad and a topped with some fresh salsa, it made for a perfect midday break. Not a bad way to use up leftovers at all! Preheat oven to 350. Heat olive oil in a cast iron skillet (or any other oven-proof pan) and add garlic and onions, sauteing until soft. Add in rice and stir until heated and slightly toasted. Season with hot sauce and salt and pepper, stirring to combine. Flatten rice to the bottom of the pan. Remove from heat and set aside. Steam broccoli and remove from heat when the florets are bright green and semi-crisp. Drain and layer on top of rice. Beat eggs with milk, chili powder and basil. Pour over broccoli/rice and then sprinkle with grated cheese. Put in oven on the centre rack for about 5 minutes or until the egg mixture is set. Then, place skillet on the top shelf under the broiler and broil for 2-3 minutes until the cheese turns bubbly and slightly brown. Remove from oven and cut into wedges. Top with salsa and serve with a tangy green salad. 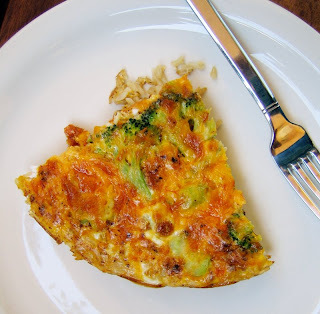 I love how healthy this is with the brown rice, and I bet it would be great for breakfast too. This is a wonderful way of using leftovers. Great recipe, Kickpleat! I never think to use rice in my eggs (which I eat all the time)! What a great idea! I will definitely try this one soon! very healthy yet flavorful. I would love to make this, and freeze some slices to have on the go for some mornings or lunches. wonderful idea! Oooh, I can almost taste that cheesy crust that formed on top. This looks soooooooo good! Once again, I am astounded. This is an ideal way to use up leftover rice. It’s like frittata almost. Veggies, cheese, rice? What could be better? Oooh that looks good! Thanks for sharin!!! A great alternative to doughy crust pizza – a rice crust “pizza”! Perfect for people with wheat sensitivities or allergies. I have to make this soon. katerina, it would be great for breakfast! thanks patricia, i think so too! sarena, rice and eggs go so well together! i always put fried eggs in my rice and so this just seemed like the next step! dawn, it’s pretty healthy (i think) and it would be great as a breakfast or lunch on the run. andrea, oooh, the cheese!!! yum. b, i love turnips! yum. bijoux, indeed! this is an excellent replacement for regular pie crusts…but i don’t know if it would hold so well without the egg. regardless, it’s pretty tasty! What a great, thrifty idea. I wish I’d seen this before I ate up my leftover risotto (cooked in a mushroom broth) – I think this would have worked well for this, too. By the way, I love that your blog features a lot of “everyday” cooking. Some of the other food blogs tend to use more expensive ingredients or complicated recipes. I like that yours has a lot of quick-and-easy pantry-type recipes that are quick after work. i’ve been looking for things to take for school lunch… this looks perfect! thanks! ana dane, i always make up extra rice for leftovers because i love making fried rice. this was a nice change. maija, thanks for the nice words about my site! i think this would have worked very nicely with a mushroom risotto! I made this and loved it! Thanks!